All major nuclear weapons facilities, research facilities, mines, dumps, etc..
DOWNLOAD POSTER for your local screening. The EXTENDED Remix version (62 minutes) was first screened on December 1st at the El Morro theatre in Gallup as a fundraiser for CARE 66 and Amnesty International. Canadian Premier! Presented by boiling frog. In the field of motion picture and audio recording production, Marc Page prefers editing. He has been a massage therapist in Fresno, CA managed a shelter for homeless men in San Francisco, been a Child Care Worker in Nevada City, CA, organized retreats and pilgrimmages to the nuclear test site in Nevada, and currently works with Pax Christi New Mexico (a group which--among other things--offers christian resistance to the violence of nuclear weapons). In New Mexico he works as a substitute teacher in elementary schools. Page is a proponent of permacultural sustainability, Christian anarchism, and the Revolution of the Heart. Marcus Patrick Blaise Page was born via C-Section about 6 miles from Disneyland, CA on a Catholic Feast Day celebrating the divinely arranged special-superduper-angelic Conception of Mary, the Mother of God. Two decades later Page's intellectual & spiritual growth blossomed in the 1980s & 1990s in Northern California & New York City. By 1990 he had earned a BA in Media Communications with a minor in Film Studies. (He was doing his undergraduate work at the California State University campuses in Chico, Fullerton, & Sacramento.) Page became involved with the Catholic Worker Movement of the West Coast in the 1990s. In June & July of 1998 he lived at Gandhi Farm in Nova Scotia. Page says, "It was the most radical vegan farm I've every found--shunning all electricity and chemicals." He hopes to join another one in New Mexico as soon as it starts (2006 or 2007 perhaps???). A summary of 20th century American radicals with a notable focus on the christian pacifist anarchist Ammon Hennacy. Faith-based activists here attempt to appeal to the dominant culture, following the radical (rooted/basic/simple) ideology and optimism that goodness will overcome evil, love is superior to hate and truth trumps falsehood. Born seven miles from Disneyland, Marcus Patrick Blaise Page later became a massage therapist, homeless shelter manager, and Child Care Worker. 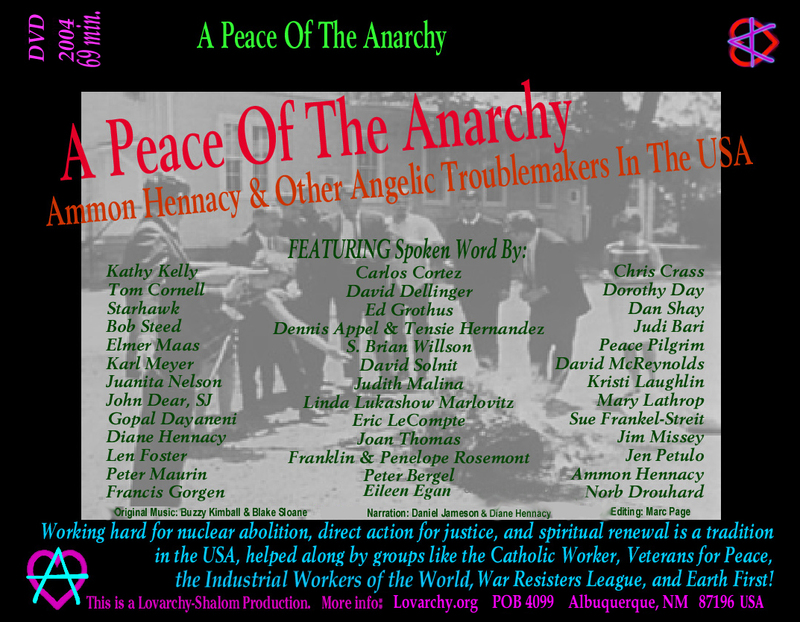 He also organizes pilgrimages to nuclear research sites, and currently works with Pax Christi New Mexico (a group which offers christian resistance to the violence of nuclear weapons).